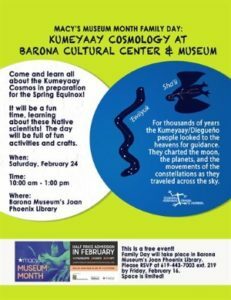 Come and learn all about the Kumeyaay Cosmos in preparation for the Spring Equinox! For thousands of years the Kumeyaay/Diegueño people looked to the heavens for guidance. They charted the moon, planets and the movements of the constellations as they traveled across the sky. It will be a fun time, learning about these Native scientists! The day will be full of enjoyable activities and crafts. Admission/Cost: FREE Please RSVP to 619-553-7003 ext 219 by Friday, February 16. Space is limited! !